GSC embarks on Sydney’s “great new experiment” in planning – but will it survive the roads lobby? The Greater Sydney Commission (GSC) officially started work on 27 January 2016. The Sydney Morning Herald in an editorial described the GSC as a “great new experiment” (perhaps echoing the title of Denis Winston’s 1957 book, “Sydney’s Great Experiment”, which described the Cumberland County Plan and Council, Sydney’s first attempt at a metropolitan-wide planning body), stating that “given the delicate, at times scandalous, relationship between developers and political parties, an independent planning authority is at least worth trying”. The paper notes however that “transport planning is fundamental to the planning of everything else”, but in NSW transport and infrastructure are still managed separately. The editorial concedes that the Coalition did manage to bring all forms of transport into one department and that when Gladys Berjiklian was made Minister for Transport the Roads ministry was a subordinate portfolio. Her replacement by a more junior minister, Andrew Constance, has made the relationship less clear. “The creeping takeover of the transport agenda by vastly expensive road projects of questionable merit such as WestConnex suggests the bad old days are on their way back”, the SMH states, though the fact that departmental heads of Transport, Planning and Treasury are all GSC members provides an opportunity to hope that “the commission can align transport priorities for Sydney with those of the rest of the community”. Greens MP and Local Government Spokesperson David Shoebridge has called for the NSW government to release a key report prepared by consultants KPMG in support of the government’s council merger policy. The call came amid claims that the Office of Local Government (OLG) had not seen the report. This was based on a reply to a freedom-of-information request lodged by Mr Shoebridge seeking the document, which stated that “The OLG does not hold the information sought”. Information on consultations regarding the proposed Phase 1 reforms of the Local Government Act 1993. These can be made via the Fit for the Future website, with a deadline 15 March 2016. Clarification that the guidelines for councils subject to a merger proposal can enter into contracts and financial agreements, as part of continuing to “deliver quality services to their communities, without unreasonably impacting the future operations of any possible new council”. Mr Brown is also critical of specific aspects of the current mergers, claiming that for example “the cynical boundary changes which dump Holroyd and Auburn councils together and deny them a strong growth area rate base are simply wrong”. The NSW government has announced a new direction for the state’s social housing “a partnership between the private and non-government sectors to deliver more homes at a minimal cost to taxpayers while also ensuring better outcomes for the community”. Minister for Social Housing Brad Hazzard claimed that the program meant NSW would be “embarking on a new era of social housing with a large scale building program which will generate $22 billion in construction activity in NSW and produce better social outcomes for the community”. Reducing waiting lists by providing 23,500 new and replacement social and affordable dwellings. Increasing the use of private rental assistance by 60% “to help vulnerable households avoid or leave social housing”. Delivering new mixed communities blending social housing with private housing. Improving amenities and safety for public and private residents. Transferring management of up to 35% of social housing to community housing providers, “with longer term leases to be determined on a case-by-case basis”. According to media reports, the announcement was initially welcomed by the not-for-profit sector as “an end to decades of policy paralysis”, despite warnings from the opposition that the “biggest beneficiaries” were likely to be the developers and investors involved in the redevelopment. After closer examination and meetings with the Minister and government officials however the head of the NSW Federation of Housing Associations, Wendy Hayhurst said she was “underwhelmed” that only 9,000 of the dwellings announced would be additional stock, well short of the “massive additional need” with a statewide public housing waiting list of nearly 60,000. Fairfax media has claimed the NSW Arts Minister Troy Grant has “cast doubt” on whether the state government will fund upgrades to cultural infrastructure in Western Sydney and regional NSW. The article indicates arts centres in Western Sydney are seeking funds from the remaining $259 million in the NSW government’s $600 million cultural infrastructure program to pay for building upgrades. Chair of the Western Sydney Leadership Dialogue, Christopher Brown responded, claiming that taxpayers in western Sydney were not receiving a fair return and asking “is the Art Gallery of NSW funded by the City of Sydney?”. The Western Sydney Regional Organisation of Councils (WSROC) has announced that the Light Years Ahead Western Sydney LED street lighting project, is entering its final phase with installations expected to be finished in March and the project completed by June. The project which received federal government funding has involved nine Western Sydney councils in a program to change approximately 13,000 mercury vapour street lights to new energy efficient LED street lights. A feasibility study will provide participating councils with data and options for continuing to roll out LED street lights beyond the end of the project. The WSROC President’s statement noted that in December 2015 the Clean Energy Finance Corporation (CEFC) announced financing options for local councils to invest in energy conservation projects. The NSW Government has called for expressions of interest for the “Procurement of Electricity from a Renewable Energy Project in NSW” for the Sydney Metro Northwest project. In what might be regarded as a contrast, the Hindu newspaper has reported on an interview with Mr Bharat Salhotra, Managing Director of Alstom Transport India in which he indicated that the company had started expanding its rolling stock manufacturing facility in Andhra Pradesh. As well as supplying 800 locomotives to the Indian Railways and over 330 train cars for the Chennai, Kochi and Lucknow Metros, the company will also export Alstom trains for the Sydney Metro Rail project. The NSW government has announced that construction for the Sydney CBD and South East Light rail will ramp up over 2016 in what it calls “The year of light rail big build”. “We have now significantly progressed vital utility investigations along George Street, which has helped refine the detailed design for the project, including determining the exact track location and where the most complex work will need to be done,” Mr Constance said. Major construction is due to be completed by the middle of 2018 and will be followed by system and vehicle commissioning before services start early in 2019. The next phase of work on Sydney’s light rail will involve the continued controversial removal of mature trees along the route. Executive Director of the Total Environment Centre, Jeff Angel, claimed that the removal process was “targeting historic fig trees planted in memory of the Anzacs” along Anzac Parade. This has been disputed by Transport for NSW which according to a media report has photographic evidence that the trees were planted in the 1870s-1880s and were therefore already mature by the time of WW1. 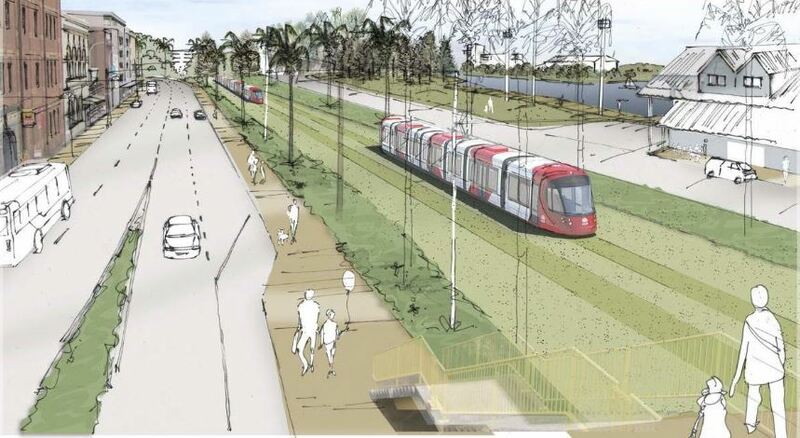 Opposition leader Luke Foley has supported the campaign to save the trees, claiming in a media interview that the trees “could be saved by moving the city’s new light rail line mere metres”. The campaign to save the trees does not appear to have affected the plans to cut them down, though the light rail project director Andrew Summers said in a media release that the project team was working to retain as many trees as possible along the route. “I can assure communities and our customers that we are committed to keeping or replanting trees rather than removing them, wherever feasible,” Mr Summers said. He also reiterated that between two and eight trees will be planted for each tree removed during construction. Two reports outlining the environmental impacts of tree pruning and removal along the route were also released and are available on the website. According to media reports the University of Sydney is pursuing a “Plan B”, a new light rail line from Central Station to Strathfied via its Parramatta Road campus after it was passed over by the NSW government in favour of Waterloo as the site for a planned Sydney Metro station. While the government is considering bus rapid transit for this corridor the university says this will be insufficient to meet the demand, especially as forecasts suggest its student numbers will grow by 26,000 to 76,000 over the next 20 years. “We believe light rail has to be the answer if we are talking about transport for both RPA and the university,” Sydney University’s director of campus infrastructure services, Greg Robinson, is quoted as saying. The report points out the proximity of Sydney’s other metropolitan universities to either existing heavy rail services or in the case of the University of NSW, the light rail line currently under construction. Transport for NSW has opened registrations of interest for companies to design and construct the planned Newcastle Light Rail. The 2.6 km line will run from Wickham to Pacific Park, replacing the heavy rail line from Wickham to Newcastle stations which was closed down by the NSW government last year. “We’re now calling on qualified organisations to register their interest for the design and construction tender for light rail. From here we’ll develop a shortlist and expect to award a formal tender by the middle of the year,” an unamed Transport for NSW spokesperson said. The registration of interest period is due to close on 12 February 2016. A shortlist of respondents will be prepared who will then be invited to tender with a contract to be awarded in mid-2016. The Gold Coast Bulletin claims to have obtained figures that indicate the full completion of the city’s light rail network would “cost more than $3 million”, blowing blow out the city’s transport budget over the next 15 years which totals between $1.5 and $2.1 billion. The estimates suggest an extension from Broadbeach south to Coolangatta will cost $2.1 billion and from Nobby Beach west to Robina at least $1 billion. “Light rail across the city will happen – it is inevitable”, an unnamed council spokesperson is claimed to have told the paper, pointing to community consultations already underway to determine future routes for the network. Independent Adelaide online media InDaily has reported that the city’s Lord Mayor Martin Haese will call a Town Hall summit to push for the expansion of Adelaide’s light rail network. InDaily claims that Haese plans to invite state and federal government representatives, mayors from all Adelaide inner metropolitan councils and business groups to the meeting before the middle of the year, in an attempt to secure consensus on the system’s expansion. He indicated however that while this would meet a number of the council’s environmental, business and population growth objectives it was “premature to suggest” that the council would fund it, pointing out that “light rail is a very capital-intensive endeavour”. Instead the mayor claims that he wants “to see the benefits of light rail quantified”, hoping the summit to produce “a strategic plan, a business scenario … or a business case” for expanding the network. InDaily claims that SA Transport Minister Stephen Mullighan welcomed the summit, saying that government had been encouraging local government to help expand the network. “The State Government is committed to expanding our tram network, following the successful extensions both to the Adelaide Railway station and the Adelaide Entertainment Centre,” Mr Mullighan is quoted as saying. The NSW government has announced that it will provide an extra weekday seats on intercity rail services between Sydney, the Central Coast and Newcastle. This will be achieved by running eight rather than four-carriage OSCAR trains. “By doubling the amount of carriages on select services, there’ll be 3,000 extra seats for customers during the week,” Minister for Transport and Infrastructure Andrew Constance said. Eight services on the line will receive the extra carriages. The Illawarra Mercury has noticed that comparable services on the South Coast line to Wollongong and other major centres south of Sydney have missed out. “This is despite the government’s own figures that show South Coast trains are more crowded than those on the Newcastle line” the paper notes, claiming that Sydney Trains data shows that in the morning peak the average load on South Coast trains (measured at Helensburgh) is 84%, compared to the Newcastle’s line average 67% at Woy Woy station. There is a similar 17% difference in the evening. Fairfax media claims that installation of a $360 million digital radio system recommended in the wake of the Waterfall rail disaster is “running five years behind schedule” and that transport officials “have given up predicting when it will be ready”. According to Transport for NSW, the Digital Train Radio System (DTRS) is a “new communication system being installed on the electrified rail network” that will “enable train controllers, train drivers, train guards and signallers working on passenger and freight services to use a single system for voice and data communication”. Fairfax media claims that the project missed its most recent deadline of last July, despite assurances almost two years ago from then Transport Minister Gladys Berejiklian that “this complex project is now back on track” following delays under the previous Labor government. Part of the problem however is due to the complexity of the task of installing new technology that has to integrate with the existing systems. The party’s transport spokesperson Samantha Dunn said that new signalling is required. “It’s about time we moved into the 21st century and upgraded our antiquated signalling system,” she said. In a media interview Mr Barber said that while the standard was 800 passengers per train, “most lines pretty close to half the trains are now exceeding that standard. Mr Barber also accused transport authorities of “fudging the figures” from regular transport surveys and called on the government to upgrade the signalling system to increase capacity. The Victorian Transport Minister Jacinta Allan has come out swinging in a strongly-worded media release, describing the current disruptions across the state’s regional V/Line rail network resulting from faster-than-normal wheel wear on VLocity trains and a boom-gate fault as “totally unacceptable”. As a result the Minister states the V/Line CEO Theo Taifalos has resigned “effective immediately”. The Minister also conceded that while services are expected to steadily improve “it will be months before normal services resume in full”, especially as while V/Line is taking steps to reduce the rate of wheel wear “extensive testing is still underway to determine the exact cause of the problem”. The boom gate issue on the Cranbourne-Pakenham line will also take time to resolve, as the National Safety Regulator has “advised that safety measures must be carried out on all 21 affected crossings”. In response the Minister announced a package of measures, including a review of V/Line operations, an extension of free travel for regular passengers, a deferral of the introduction of upgraded services and the appointment of Gary Liddle, currently CEO of Public Transport Victoria, as the interim CEO of V/Line. In a wide-ranging speech to the Auckland Chamber of commerce, New Zealand Prime Minister John Key has confirmed that his government will work with Auckland Council to bring forward the business plan for the City Rail Link and “formalise” its funding commitment to the project from 2020. The move, which as reported in TSW4 had been widely anticipated, will as the PM indicate “allow the council to get on with negotiating contracts and providing certainty for investors in other important Auckland CBD projects”. The commitment to contribute to the costs of the NZ$2.5 billion project to connect the existing Britomart terminus for suburban trains via a loop under the CBD to connect with the existing western line at Mt Eden station does have some strings attached. “We still need to work through a number of important and quite complex issues with the Council,” Mr Key said. “These include how project costs will be finally shared between the Government and the Council and how the Rail Link will be owned and managed. Media outlet StuffNZ has suggested that a key factor in these negotiations is the council’s desire to help fund its share of the new link by introducing motorway tolls. The PM it suggests believes that the council had plenty of other sources, including rates or raising debt, while Auckland Mayor Len Brown supports the toll proposal. In addition the Prime Minister’s speech shad a strong emphasis on road funding including the East-West Connection motorway planned for Auckland and a number of regional road projects. In an opinion piece for Fairfax media Independent Pricing and Regulatory Tribunal (IPART) CEO Hugo Harmstorf has strongly defended the organisation’s recommendations for changes to public transport fares in NSW. The proposals (see TSW4) involve ending the multiple flag falls which still apply under Opal for mode changes on a single trip but also would introduce increases in fares for longer journeys and mean the end of the loophole which allows passengers to take short, unnecessary trips early in the week in order to qualify for free trips on their actual much longer commute. The proposals which received the strongest opposition (see TSW5) were plans for the senior’s gold pass daily cap increased from $2.50 to $3.60 and its eligibility effectively limited to people receiving pension. “An efficient public transport system is essential for a liveable, modern city,” Mr Harmstorf stated. “The challenge is determining how to pay for an expanding system in a way that is fair to those who use a lot of public transport, those who travel occasionally and those who never use it at all,” he said, noting that fare currently cover only about 20% of the $5.5 billion annual public transport cost. Mr Harmstorf’s article makes it clear that there has been a tradeoff between the recommendations on removing the flag fall and those tightening up the multiple trip discount. “We believe that the changes proposed in our draft report would make the system fairer and more efficient. But most importantly, everyone who uses public transport and those who pay for it – as passengers, taxpayers or both – need to have their say about our proposed changes,” he concludes. The Western Sydney Regional Organisation of Councils (WSROC) has called for a review of motorway tolling especially for the WestConnex and M5 East motorways because of “increased toll charging inequities” across the city’s network. “The current pricing regimes across the network ensures that motorists using different sections of the network pay vastly different sums for similar journey benefits,” WSROC President Clr Tony Hadchiti said. “The introduction of tolls on the M4 from Parramatta to Strathfield as well as the M5 East, NorthConnex and the WestConnex will have a significant impact on travel budgets for many Western Sydney families and businesses,” he said. Clr Hadchiti noted that there are no longer any technological barriers to more consistent tolling. “If harmonisation of tolls cannot be achieved then at the very least the sharing of data between toll road operators and government could lead to differential charging so that users of multiple motorways for a single journey would have a daily network cap applied to their use,” he said. This entry was posted in Cultural Development, Environment, Governance, Growth, Infrastructure, Local Government, Planning, Public Transport, Regions, ROCs, Sydney metro area, The Strategic Week, Transport, Western Sydney and tagged Environment, governance, Growth, Infrastructure, light rail, Local Government, Rail, regions, ROCs, State Government, Strategic Planning, Sydney metro area, Transport, Western Sydney. Bookmark the permalink.